Not got much time or just want the bullet points on how to make delicious homemade refried beans? Click here for my Quick Read Refried Beans Recipe. 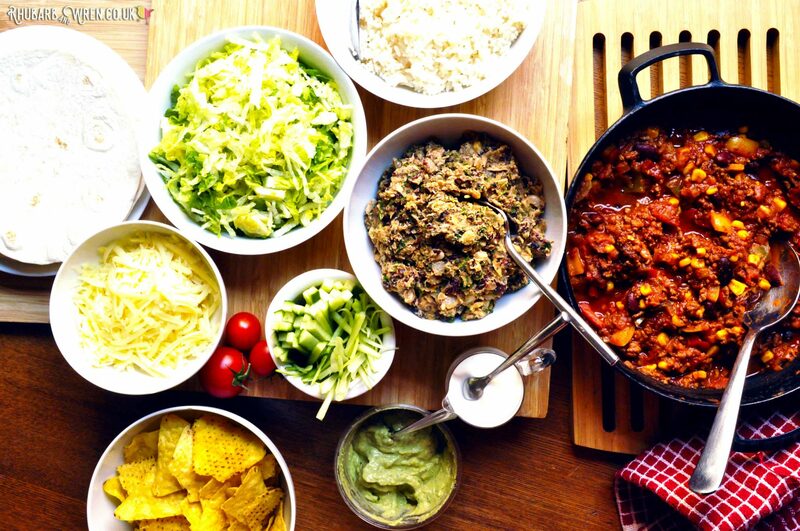 Chilli is one of my family’s favourite meals, and one of the reasons the kids (and grown-ups!) 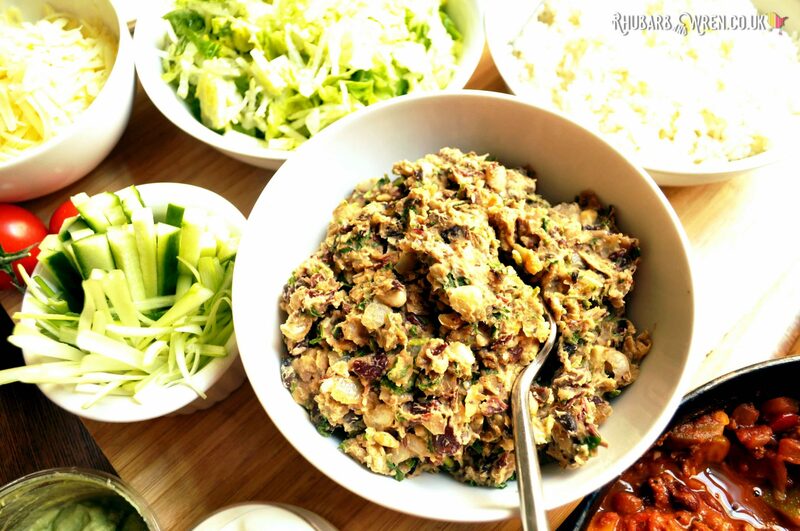 love it so much is because we tend to make it a feast with a pile of side dishes and chilli toppings. Chief among these is the not-so-humble refried beans. This family friendly chilli is a favourite recipe for my kids, especially when served with toppings and wraps! If you’ve only ever had (or avoided having!) the tinned variety, you’re missing out, because homemade refried beans are nothing like the canned stuff. Refried beans made my way are also healthy (and vegan! ), because they avoid the salt and animal fat that can make the tinned beans bad for you. Above all, when you make your own refried beans, you will find that they have a wonderful herby freshness and limey zing no canned version will ever be able to emulate. So then, toss your can opener and try this quick and easy recipe! The beans might come from a can (or a frozen packet), but everything else is fresh! 1 tsp cumin, 1 tsp paprika and 1 tsp of chilli powder (mild chilli powder is best for kids or those that don’t like their food too spicy). Pinto beans are the traditional choice for a refried beans recipe. 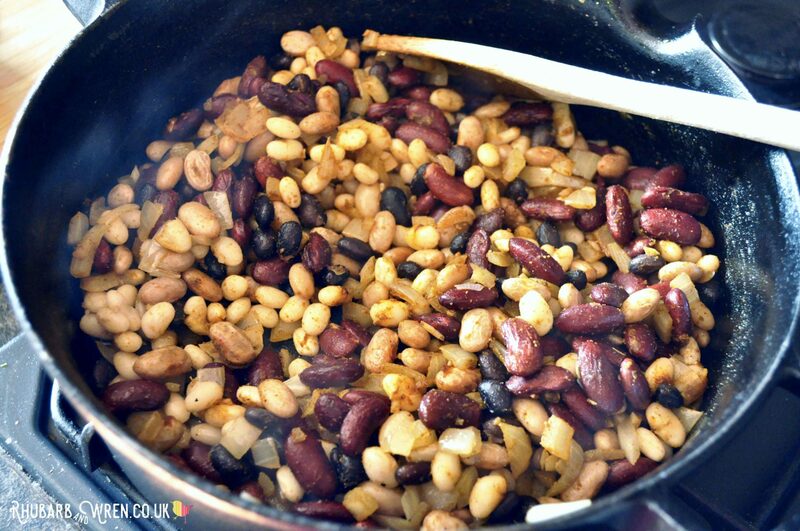 However, I tend to use a four-bean frozen mix (it works just as well with tinned!) 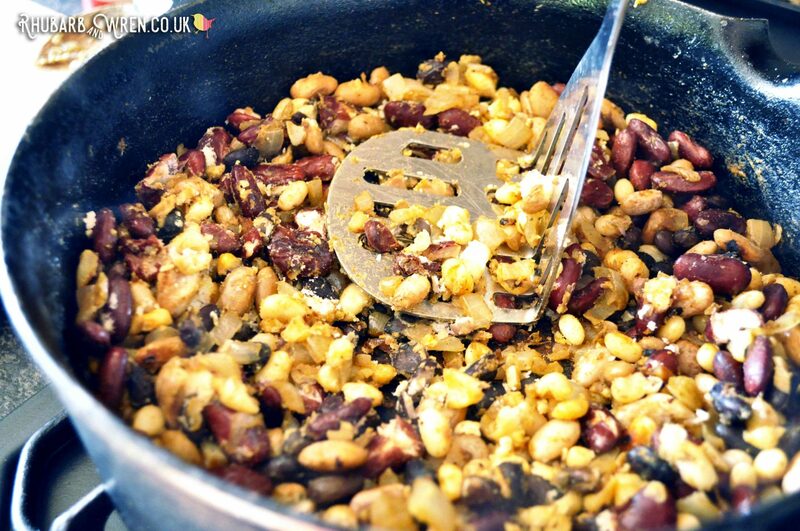 that’s made up of red kidney, haricot, black turtle and pinto beans – I like the texture and flavour this bean mix gives to the finished dish. If you want yours creamy and smooth, try using pinto beans only. 1. Start by heating the oil in the pan, and frying the onion and garlic over a medium heat until soft and translucent. 2. At this point, sprinkle on the cumin, paprika and chilli powder. Stir and cook for another minute. 3. Next, add the beans to the other side of the pan, and cook on a medium heat for a few minutes to soften them up a little. I like to use a mix of beans for extra colour, flavour, and texture. 4. After the beans have cooked for around five minutes or so, remove from the heat, grab a masher and crush your beans. I like a bit of texture to my refried beans so I don’t do this bit in a blender, but if you want them really smooth you could blend them in a food processer. Crushing the beans by hand keeps a lot of texture to the dish. 5. Now, turn the heat back on and cook for another five minutes to warm everything through. You may want to add some water at this point if the mixture is very stiff and thick. 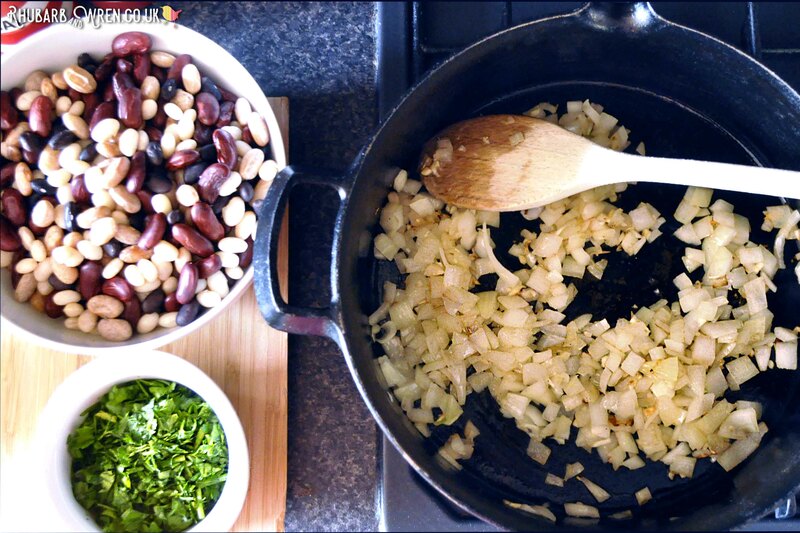 Add your herbs right at the end – they don’t need cooking, just stir them in to the hot beans mix! If this recipe for homemade refried beans has got you hungry for more, check out this video from the History Channel to see how canned refried beans are made. Or alternatively take a look at this article from Pearson Ed to delve into the fascinating history of the bean and find out why this dish is called ‘refried beans’ when they’re actually only fried once. Looking for more delicious family recipes? Try these! 1. 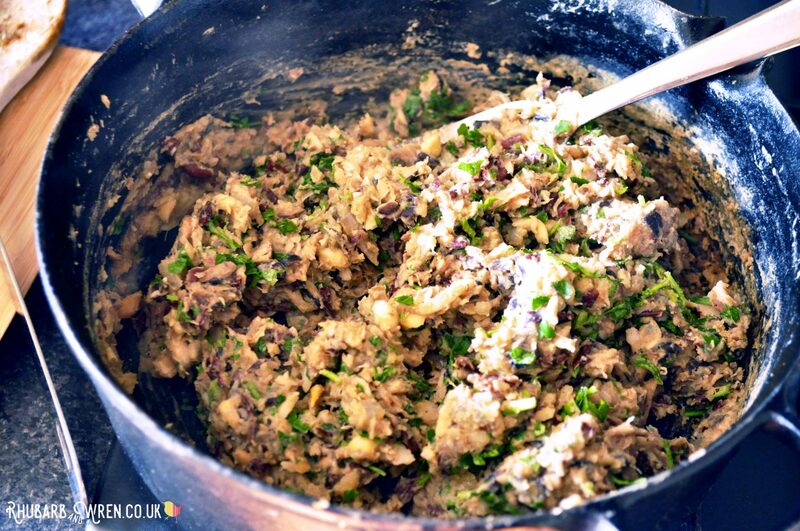 Start by frying the onions and garlic in the oil until soft. 2. Add the cumin, paprika and chilli powder. Cook for another minute. 3. Next, add the beans. Cook on a medium heat for five-ten minutes. Then remove the pan from the heat. 4. 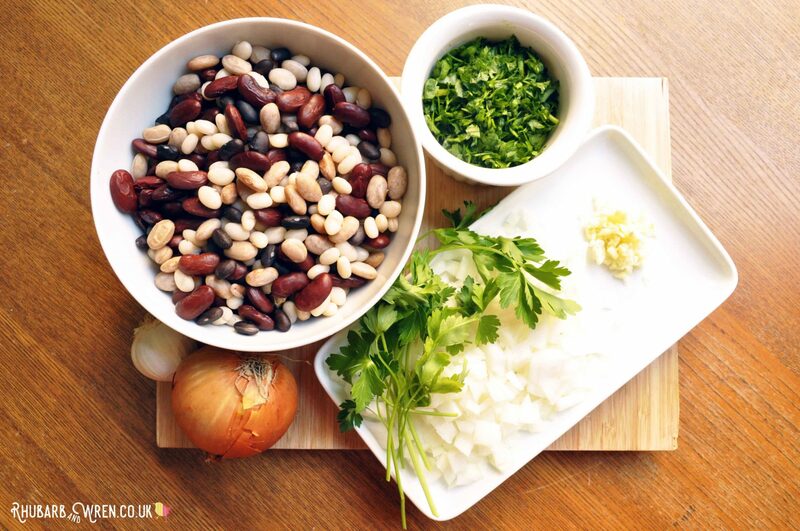 Use a masher to crush the beans, or use a food processor to blend them more finely. 5. Put back on the heat for another five minutes. 6. Finally, add the chopped parsley and lime juice, and season. Your homemade refried beans are done! Homemade refried beans are so much nicer than the tinned stuff, and make the perfect vegan comfort food! Ooooo these sound delicious. 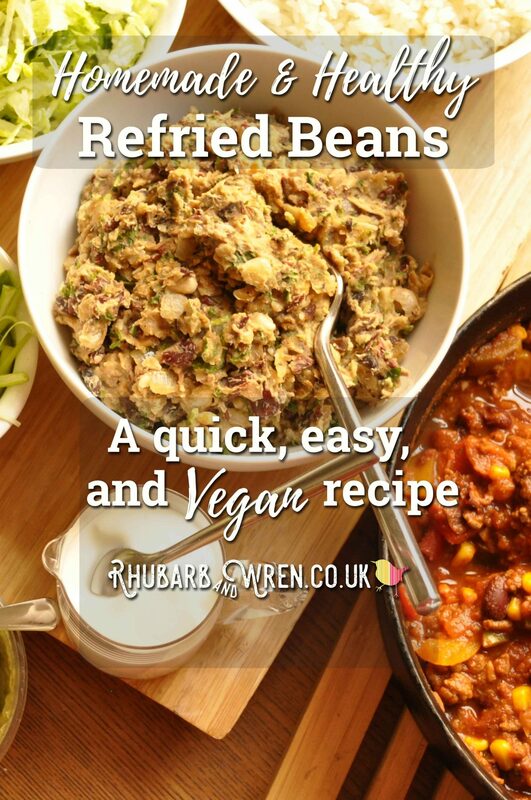 I love all sorts of beans and am constantly looking for new ideas as we are vegans, so need to try beans in differing ways!! I love the green beans (no idea what they are called but in a lot of ready salads in the UK) but can’t buy them here other than in the fresh salad section which gets a little pricey! Hmm, do you mean edamame (soya) beans? They are delicious! I buy these frozen, as they’re cheaper that way (I actually use a frozen ready mixed pack of beans for this recipe too, rather than tinned). This sounds amazing. I’ve only ever tried the tinned version and hated it but this sounds super easy to make and delicious as well. I’m going to pin this so I can try it at home! Oh I ADORE refried beans but I have to admit that I am very lazy and normally buy them ready made. I’m going to try to make and this recipe though as it sounds delicious and will taste far nicer than the ready made ones! Definitely worth the effort – especially since it really doesn’t take much to make them! As a vegetarian, I’m ashamed to say I’ve never eaten refried beans before. In fact, I didn’t even know what they were! They sound tasty though, I love that you hand mash them so there’s a bit of texture left. We’re definitely going to have to try this! I’m not a fan of the tinned variety but this looks so tasty!